The digidestined continue to fail, but Cody's continued befuddlement at both Angry TK and BlackWargreymon remains the subject of interest. There aren't many parallels drawn between the two, but considering that Cody's ability to do anything about the second hinges on his ability to understand the first makes connecting the dots crucial. What's unusual is that the BlackWargreymon situation is the most dire, yet Cody takes the most drastic steps and leaps to conclusions in an effort to sort it out. The notion that he has a heart is hearsay from Gabumon, who heard it from Agumon, who based it on circumstantial evidence. This is enough to convince Cody to stand in front of a destiny stone, believing it will deter BlackWargreymon from destroying it. He's wrong. Cody takes a lot of heat for being a dull, stubborn little runt, but this move shows the value of dull, stubborn little runts. As far as the imposing threat goes, it's one of the most suicidal things any kid ever tries in the show. He does it not because he believes it will work, but because he's so damn sick of BlackWargreymon destroying destiny stones that he'll try anything that might work even if it kills him in the process. This is stupider than anything Davis does all season and Cody makes it work because he's so dull and stubborn. Strangely, while Cody's putting his life on the line based on a hunch, he's Joe Friday when it comes to figuring out TK. He interrupts Matt's band practice to get the scoop from big brother, hearing about the Devimon incident for the first time. Cody accepts this answer, feels like he understands TK better, and even feels a stronger bond with Upamon as a result. Only problem is that contrary to popular belief, the Angemon incident is not what causes Angry TK. That may be the underlying reason for his inability to tolerate the manipulation of the dark forces, but there's a lot more going on in Angry TK's head right now, and Matt should be quite familiar with it. Last season, Matt was very protective of somebody and was stunned when that somebody got themselves out of a scrape without any help. He was very confused by this and withdrew from the rest of the group, showing clear signs of scorn for the team's leader. It was one of the biggest moments of season one, so it's a little shocking that nobody's noticed that TK is going through the exact same thing. Like Matt, TK's been very protective of somebody, and was recently stunned when she said she didn't need his help getting out of a scrape. He's seemed a bit ticked off ever since, and does not accept an invite to Davis's house after Ken, Yolei and Kari accept. In other words, withdrawing from the rest of the group and showing clean signs of scorn for the team's leader. Feel free to factor in Kari's friendzoning if you want; it fits into the equation very well. The only difference between Matt's situation then and TK's situation now is that there isn't a Cherrymon driving TK off the ledge. He's just left to stew in both his confusion over watching Kari handle her own problems and his resentment over Davis becoming a proper leader. Don't forget that TK has tried to undermine both. It's a shockingly dark side to TK, and provides a clean parallel to his brother. Nothing really comes of it, because ultimately he too recognizes the need to work in harmony with the dull, stubborn little runt. Is there any particular reason Arukenimon and Mummymon are hunting Mojyamon or is it purely recreational? 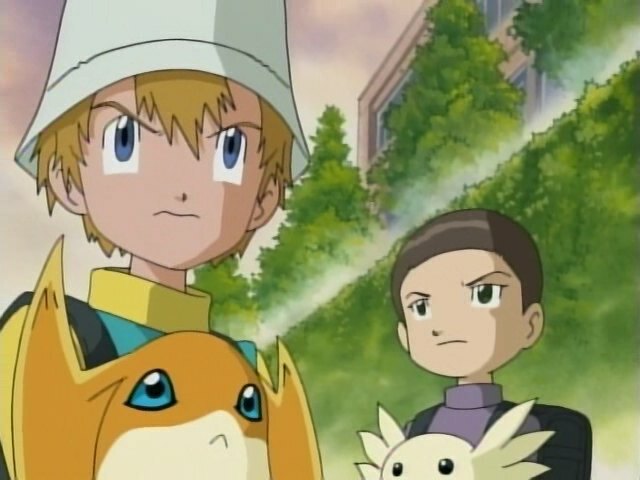 Their presence but lack of purpose in this episode leads them a bit more into the Team Rocket territory everybody plops them into. 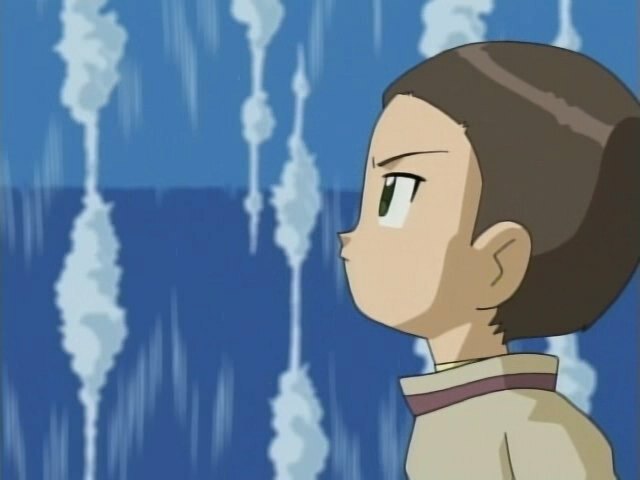 Lost in the Cody/TK/BlackWargreymon drama is the fact that Ken's mother is moved to tears by the thought of her son having actual friends. It's been a while since they've visited this angle, but it's still an important note. 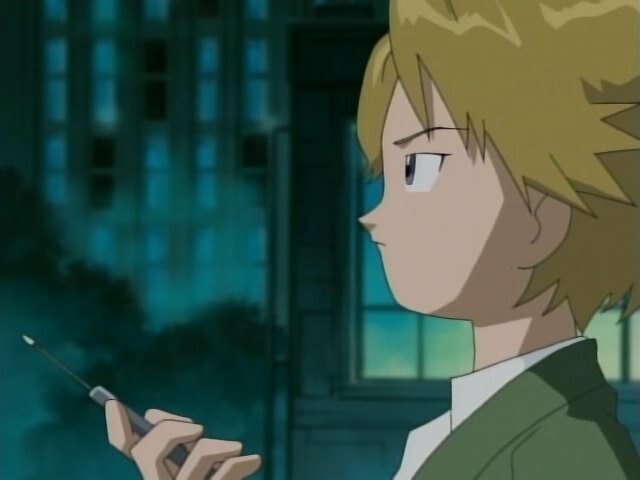 Like Sora did in season one, Cody makes the strange assertion that the digidestined are “lucky,” a day before he's standing in front of a gigantic monster of death. TK is extremely snide to Matt when he learns about Cody's visit. With a bright smile on his face, his claim that Cody thinks too much is a little unsettling. As part of the undersea army trying to stop BlackWargreymon (which includes MegaSeadramon... which has to be awkward), Ikkakumon says they're sure to win with Submarimon on their team. Really? He and MegaSeadramon would pummel Submarimon! The dub sneaks in another religious reference talking about Moses parting the Red Sea. Not as edgy as the 666 stuff last season, but it's something to point out. That's a pretty interesting thought you've got there. I always wondered why they tried to play the "Angemon dying" card in the second season while he was basically unaffected by it in the first moments after he realized that his partner would be reborn. I used to think that it was just a poorly written script but there really are certain similarities between him and his brother in spite of the perfect appearence he usually keeps. P.s. :This is my first time responding to your blog. I just recently discovered it while I was rewatching this show for the first time in forever. You are doing a terrific job provoking thoughts about the subtext in this show which most of us overlook because we were too young to actually realize there actually is something called subtext when we first watched this show. I like the parallel you make between season 1 Matt and season 2 T.K., especially since older T.K. is a jerk compared to his younger self. I think this episode is completely in line with Cody's character, but it's still a little strange that he would be so defensive of BlackWargreymon yet so unforgiving of Ken. "The dub sneaks in another religious reference talking about Moses parting the Red Sea." Well, actually Davis did it, and I was just laughing at how Ken, the supposed genius, actually played along by saying, "Maybe this is the Digital World equal of the Red Sea." It is weird that TK would be ticked off of kari when he wanted her to be independent like it stated in the japanese endg sub, that is why they fought at the dark ocean episode. I'm sorry, but I don't agree that T.K. is jealous of Davis. As far as I remember (and correct me if I'm wrong) he never had a real fight with Davis, at least not like the ones Tai and Matt used to have in season one. I don't buy the claims you've been making, that T.K. plays mind games with Davis and Cody. Call me naïf, but he's twelve! He's a kid! The only twelve-year-olds who play mind games with people are the ones who grow up in the Hunger Games world - and not even all of them! Besides, if he really resents Kari - someone his age, someone with a similar level of experience in the Digiworld, a FEMALE - for her independence (and I don't believe he does), then he really is a jerk.